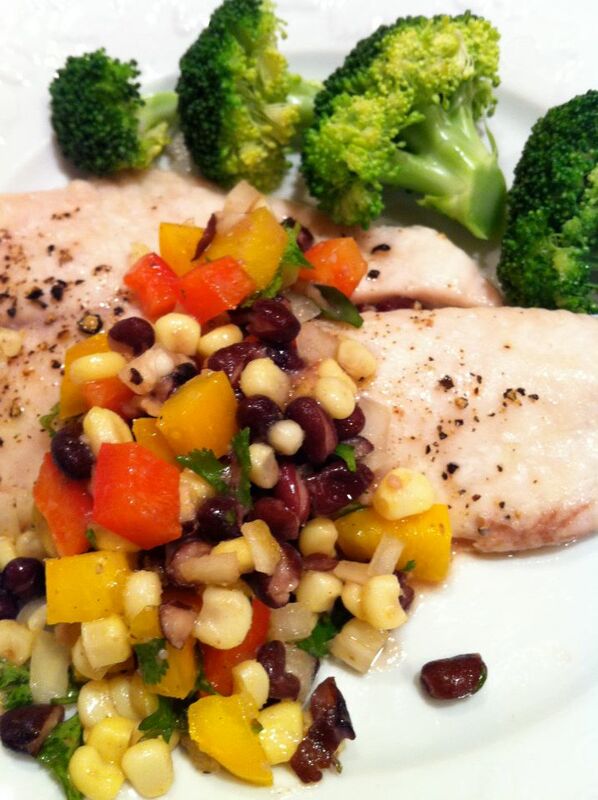 After pizza and birthday cake yesterday…and, oh yes, a doughnut for breakfast!…Baked Tilapia with Black Bean Salsa hit the spot. Full of flavor, satisfying yet light, and packed with nutrients…this is a perfect dinner to put on your regular rotation. The prep-ahead salsa is simple and makes enough to be used in other delicious ways over the next few days. The seafood cooks in 10 minutes making this truly fast food. Mix all ingredients in a large bowl and refrigerate until ready to use. The longer it sits, the more the flavors blend and the tastier it gets! Serve cold or at room temperature. Place desired number of fillets on a greased baking sheet with sides. Brush lightly with olive oil and sprinkle with kosher or sea salt and freshly ground pepper. Bake for 10 minutes at 350 degrees or until fish flakes easily and is opaque on the inside when tested with a fork.